Replacement showed up in no time and has been performing as expected. Great service from Ink Technologies. I've always got great pricing for good quality products. Replacing the drums has greatly extended the life of my printer. It just keeps on working! InkTechnologies.com always delivers a great product. I order maybe twice a year and we print a lot. The quality is always good and in my old printer it is a great product. Remanufactured Okidata Toner Cartridge, Cyan, High Capacity 5,000 page yield. Replaces Okidata part number: 42127403. Color Laser Toner Cartridge compatible with Okidata C5100, C5150, C5200, C5250, C5300, C5400, C5450, C5510. Remanufactured Okidata Toner Cartridge, Yellow, High Capacity 5,000 page yield. Replaces Okidata part number: 42127401. Color Laser Toner Cartridge compatible with Okidata C5100, C5150, C5200, C5250, C5300, C5400, C5450, C5510. 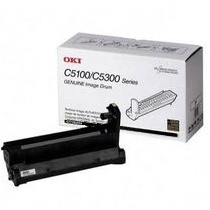 Remanufactured Okidata Toner Cartridge, Black, High Capacity 5,000 page yield. Replaces Okidata part number: 42127404. Laser Toner Cartridge compatible with Okidata C5100, C5150, C5200, C5250, C5300, C5400, C5450, C5510.